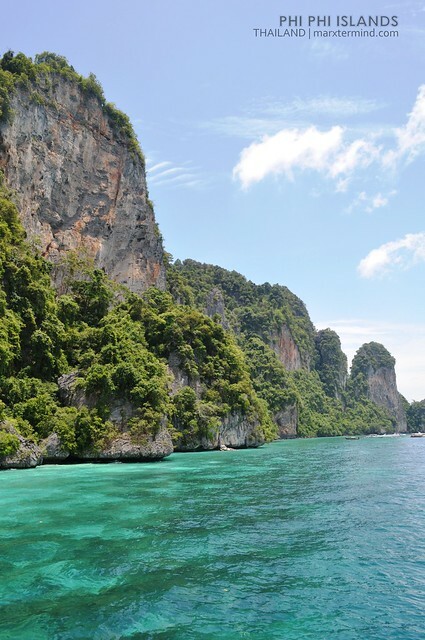 No doubt Thailand is one of the countries that will make it on the list if we talk about beaches. 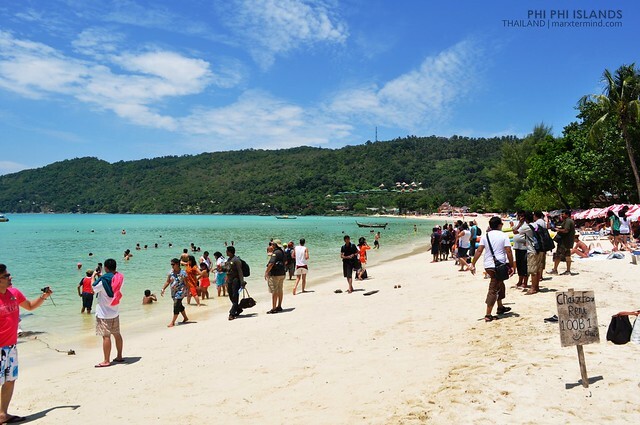 Very evident because of numbers of mesmerizing beaches that could be found across this country. 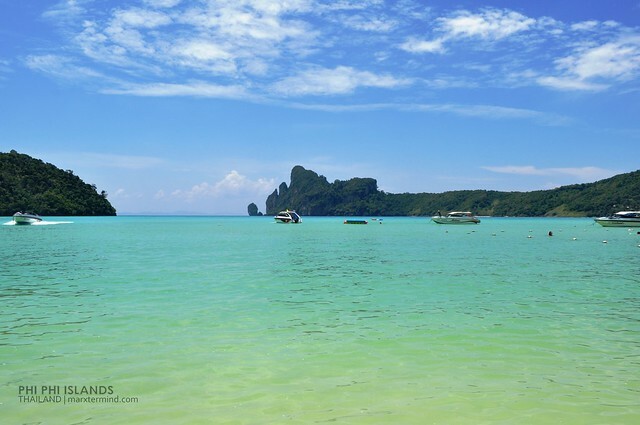 I think one should not leave Thailand without getting to one of their nicest beaches. 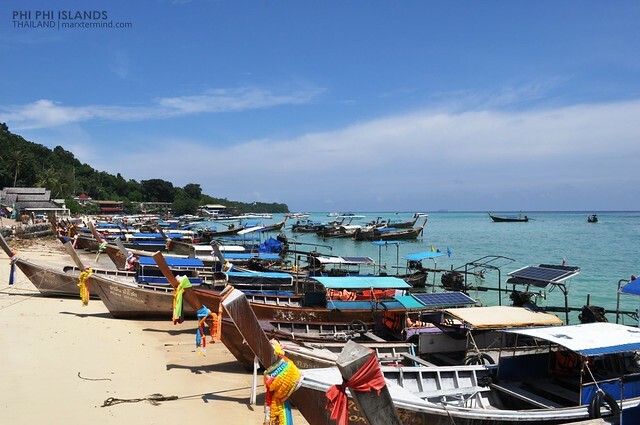 Well speaking of beaches, the main reason why I actually went to Phuket is to see the beautiful beach which has been made as the setting of the movie starred by Leonardo DiCaprio, ‘The Beach’. 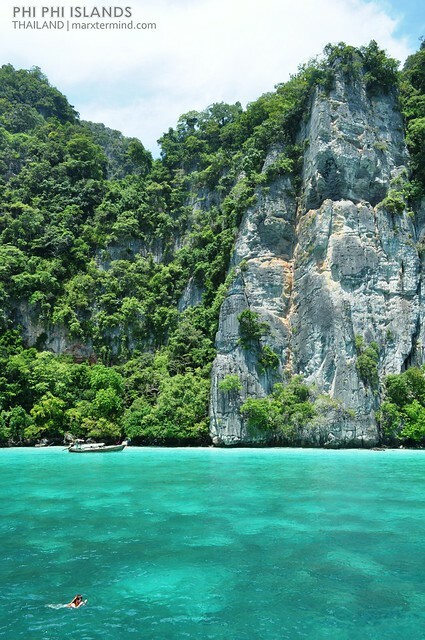 Well the beach isn’t really located in Phuket but somewhere in Ko Phi Phi Don. 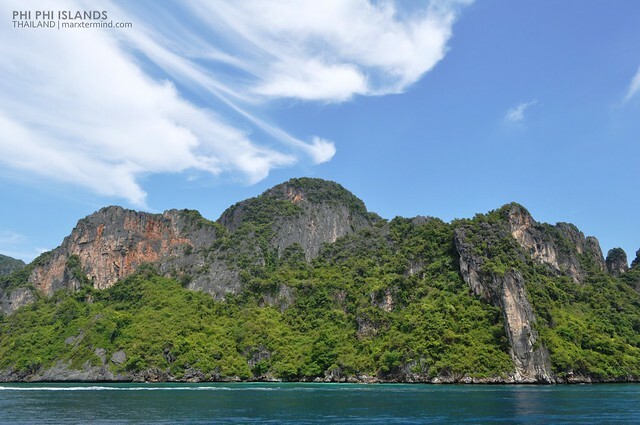 The movie is an adventure drama that tells about the story of twenty-something man named as Richard who traveled to Thailand and found himself in possession of a strange map. Rumors said that it leads to a solitary beach paradise, a tropical bliss – excited and intrigued he then made a plan and set out to find it. Though the beach seen in the film is not the same as in real life and some changes have been made to make the place a lot more of paradise-like I’m still eager to see the place. 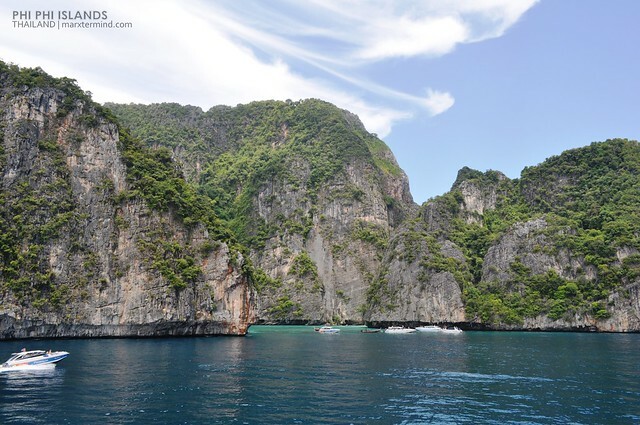 We made arrangement of our day tour to Phi Phi Islands with our guesthouse. Of course we haggled, the receptionist was too kind to help us and asked the travel agency if we can have discounts for the said tour. 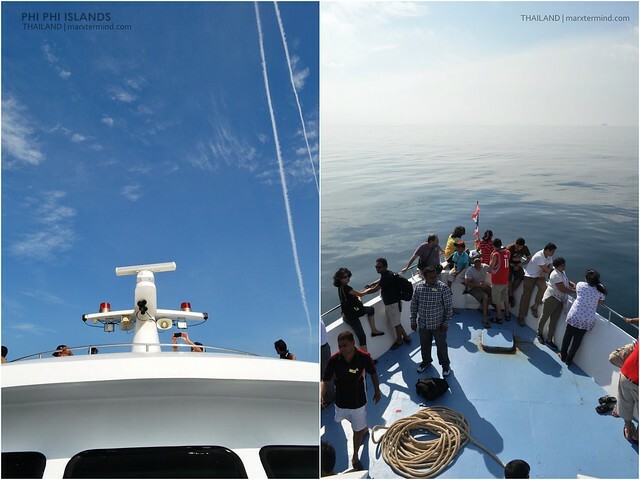 After some talks, the tour was given to us from its original price of THB 1,500 to around THB 850 each. A good deal already, isn’t it? We were picked up from our guesthouse at around 7:20 AM (ICT). The itinerary given to us says that we we will be picked around 7:00 AM (ICT) to 7:10 AM (ICT). My friends were already at the reception area by that time waiting for our driver, guide or some sort. When the driver arrived, he told us he was waiting for us already by 7:00 AM (ICT) and he just went back to fetch us again. He was keep on insisting that he was there but the truth is he wasn’t there. He was just making some alibis because some of the tourist that joined the tour as well were already complaining of the van’s late departure. 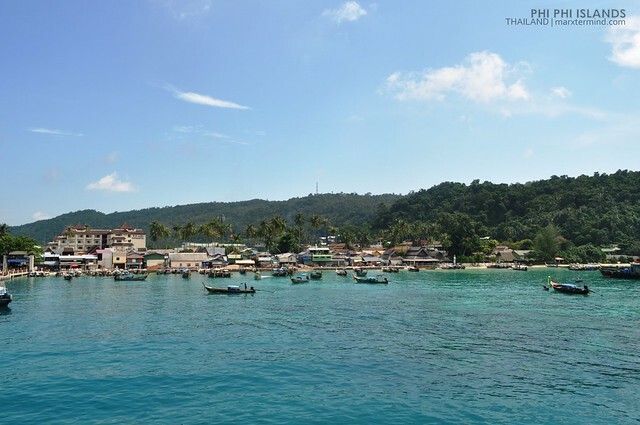 Anyway, to make the story short we left Pa Tong Beach area around 7:45 AM (ICT). 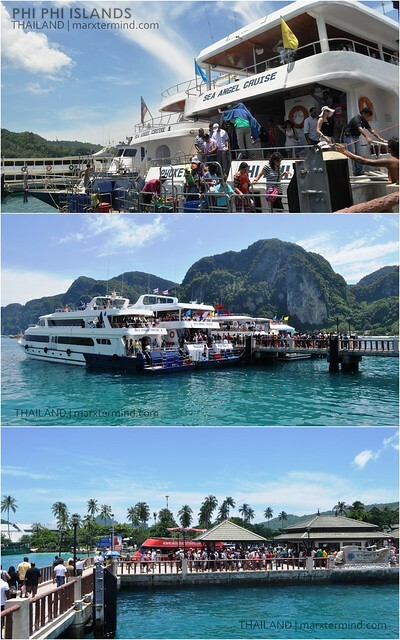 The ferry that goes to Phi Phi Island departs at 8:30 AM (ICT). We only have 45 minutes to make it to the pier and going there takes about an hour. Fortune was on us, we were able to make it to the pier. The cruise, Sea Angel Cruise, that we will be taking wasn’t leaving yet. Our driver gave us stickers attached to our shirts so to identify us as joiners of the day tour. I was shocked with the number of tourist going into the pier. I thought there’s a commotion or some sort. There’s no orderliness. The lines are messed up. Thought the chaos will be over when we got into the ferry, the inside was scruffier. Tourists getting in and out, looking for place to settle or not to settle. Sigh! After all the chaos, we were able to find seats for us. We settled down and take a moment to pause from all the disarray happening around. Sigh again. There’s a group of people that couldn’t stay put and just settle down. They walk everywhere, in and out, up and down. They are confusing, we can’t understand them. Another sigh. The ferry leaves the pier at around 8:30 AM (ICT). A complimentary coffee, tea and dessert was served to its passengers. Another commotion again, sigh. If you can only just imagine how many passengers we are in that ferry. Most of the people doesn’t have their seats and left with no option but to sit in the floor. Can you imagine that disorderliness? 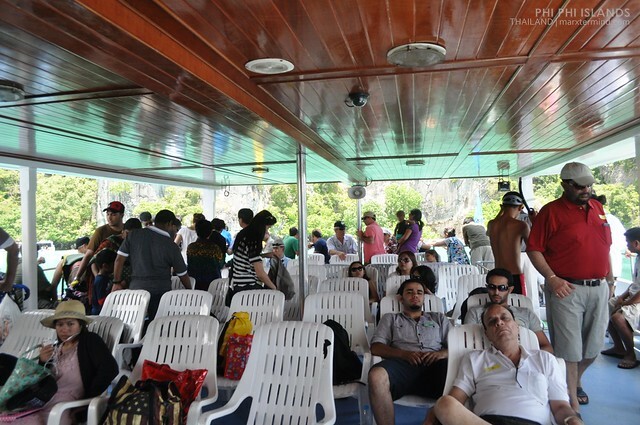 In fact, the ferry was overloading passengers. This is ain’t the luxury cruise that we were imagining of as stated in their flyers. 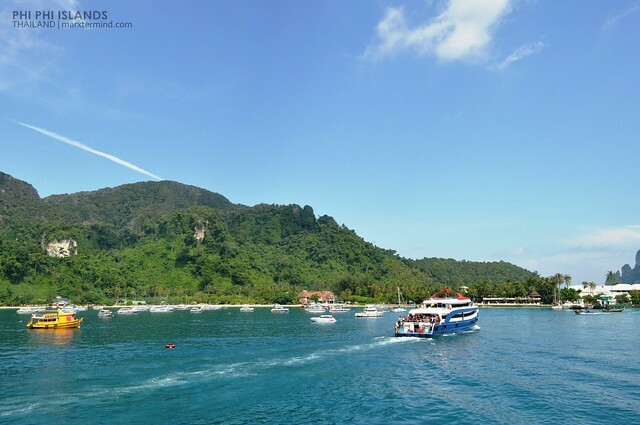 Anyway enough of the rants, the ferry continually sailed the sea going to the island destination. 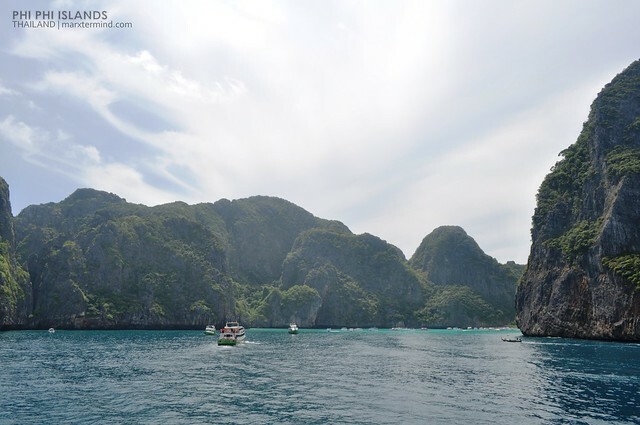 In about one and a half hour, we had finally arrived at Phi Phi Island. We were instructed not to alight yet as the ferry was going to drop those passengers who had taken a one way ticket to the island only. 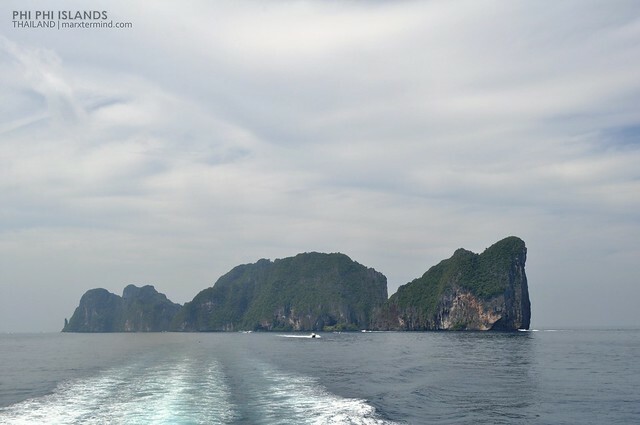 Afterwards, the ferry cruised the sea subsequently toured us to the nearby islands. 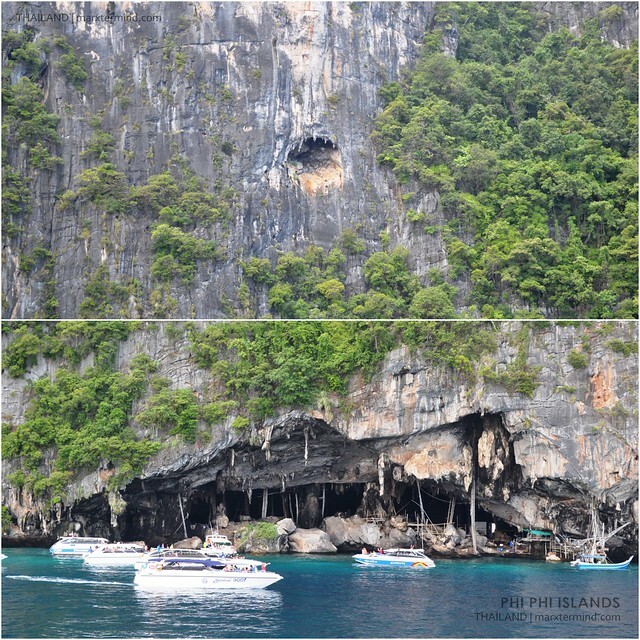 Instead, the tour just let us sight see these remarkable spots; Maya Bay, Loh Sammah Bay, Pileh Cove and Viking Cave. 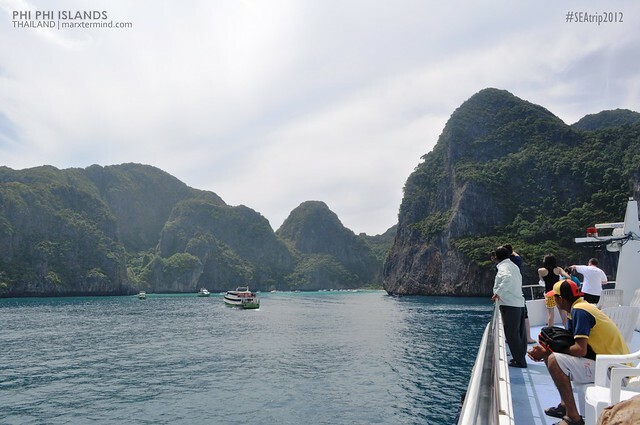 Passing by… a glimpse of the sought after Maya Bay. 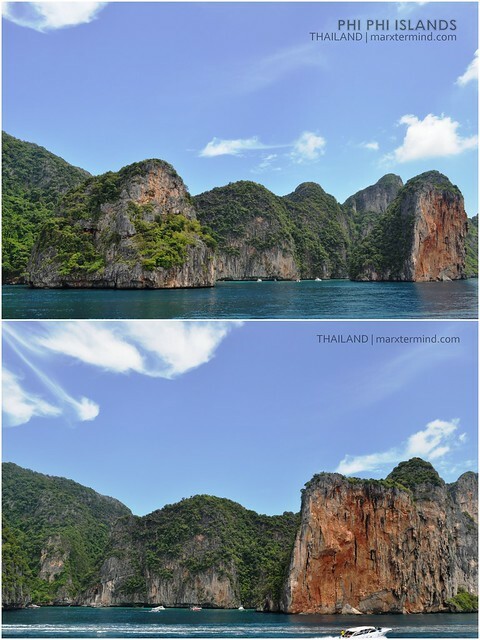 After passing by these islands and spots we stopped at the Monkey Beach. This is where we’re going to take a dip into the sea, have a swim and play with the water. 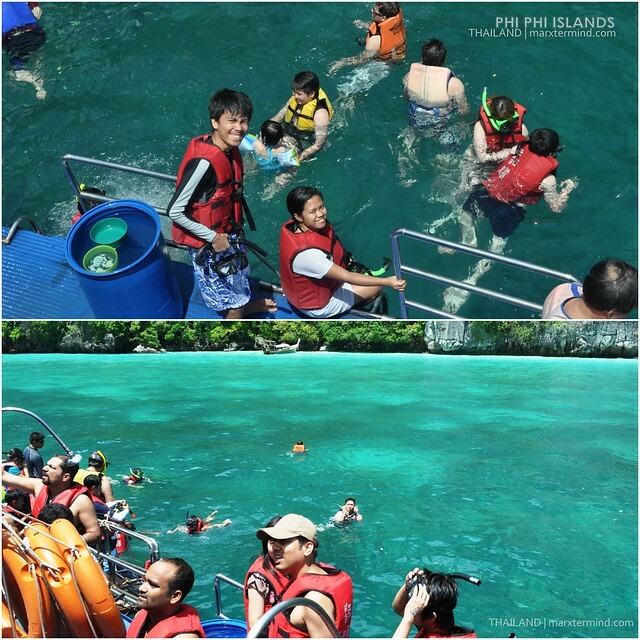 We were given a snorkeling gear and life vest so for us to be safe while exploring the sea on this area. The passengers started to make chaos again. Some decided to take a rest while some take a plunge. Me and two of my friends jumped in to the sea. Who wouldn’t want to experience this such beauty? We’re here already so why let it pass. 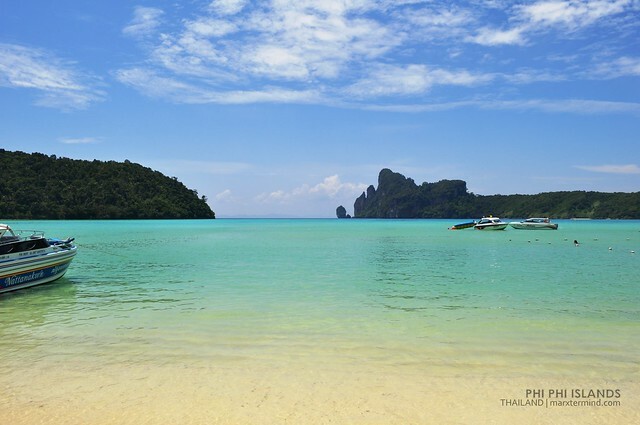 Let’s experience the water of this beach which Thailand is bragging about. 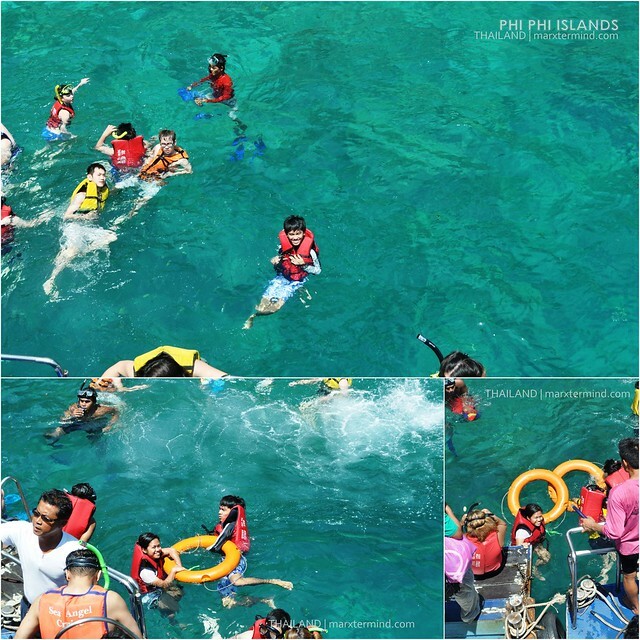 This was my first time to swim with hundreds of tourists. I moved away from where the ferry docked. I swam going near the shore. Too bad I didn’t have an underwater camera with me then, I wasn’t able to take pictures of the shore closer than these photos. True to its name, there’s a lot of monkey hanging around at the shore. Some of the tourists play around with those monkeys but I didn’t dare to do the same. First and foremost, I don’t really like playing with animals (well aside from fish) and I don’t know how to mingle with them. After all, they are animals and as an ordinary person, I don’t know how to handle them, their actions and behaviors. So I stayed a little distance away from them enough not to grab me in case worst thing happen. Although I was dismayed not seeing the Maya Baya in its full view, the view of the Monkey Beach took away my disappointments even for just a short period. 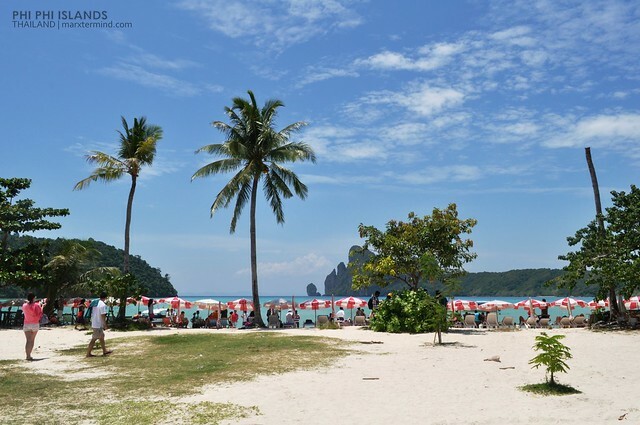 We left the beach at around 12:00 PM (ICT) and went back to Phi Phi Don to have our lunch. 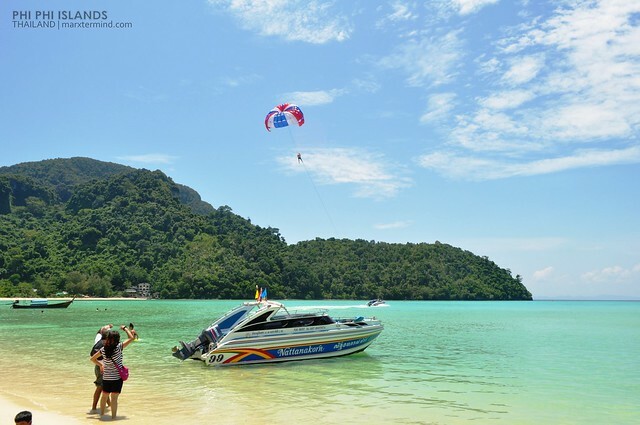 If we only have a lot of time then we will definitely stay for a night here and hire a long-tail boat to take us to Maya Bay and nearby islands. Next time, I know there’ll be. We paid THB 20.00 each for the Parking Clean when we alighted from the ferry. It seems like the fee is like an environmental fee or some sort. 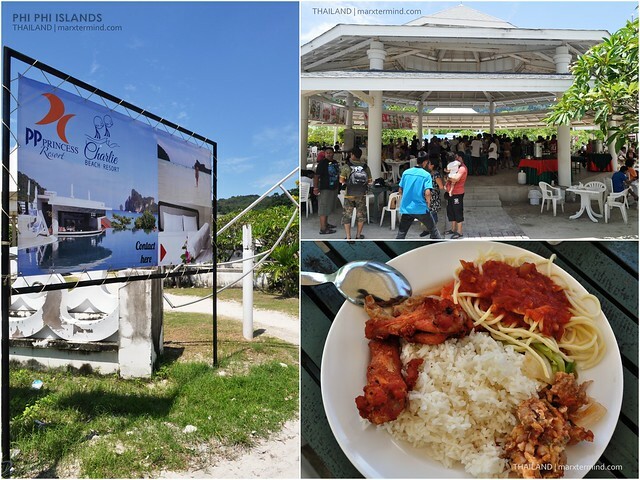 Anyway, we moved on and walked towards the PP Princess Resort wherein our lunch is served. We were given an hour free time so after finishing our lunch, we went to the beach and see what’s in there. We explored the surroundings and relaxed for a few minutes while we wait for our departure. Indeed, a great view to stare at. I planned to take a dip and experience the beach but that didn’t happen. I was already feeling lazy and I would only want to sit back and just look around. There are some water sports available in the area. 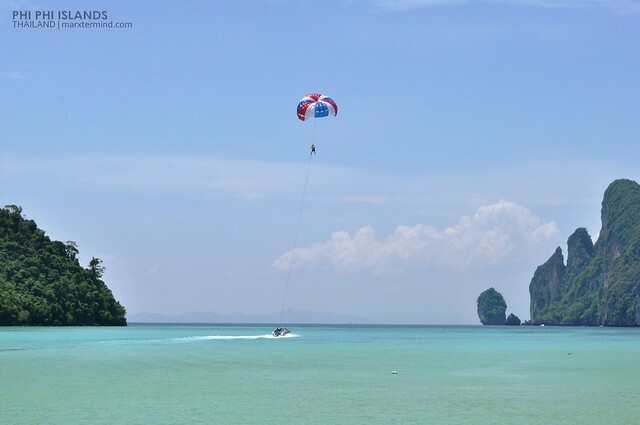 There are banana boat rides and para sailing which somehow reminded me of adventures in Boracay. We left the area at around 2:00 PM. We passed by some souvenir shops. We looked for something that we could bring home but none interested us. We went to the pier and went to our designated ferry boat. We then had a little chit-chat with them and talked about those disappointments that we had about the ferry cruise and the other passengers. We shared the same sentiments, after hearing each other stories. We left the island at around 02:30 PM (ICT) and sailed the sea back to the mainland. 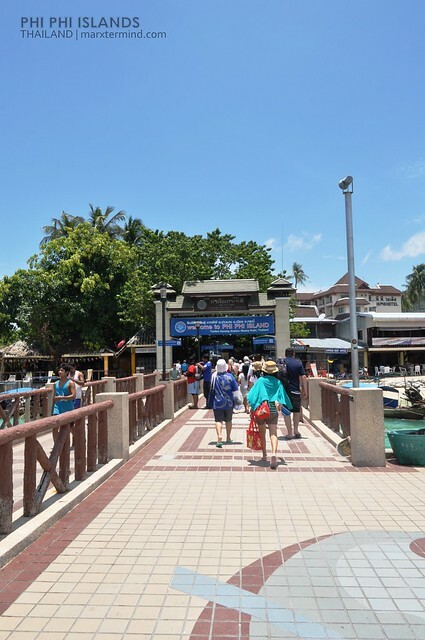 We arrived at the pier at around 4:00 PM (ICT). We then took by our van back to our guesthouse in Pa Tong. 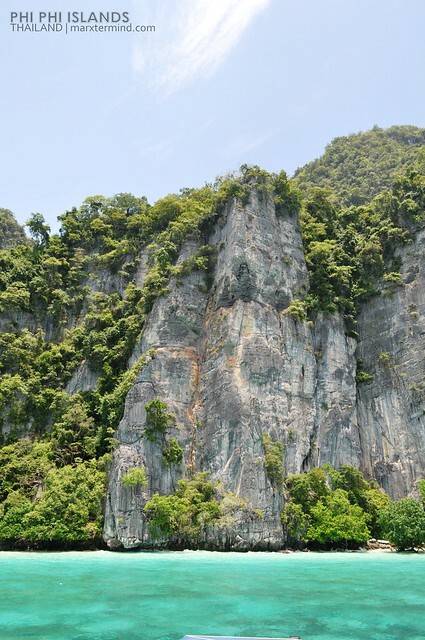 Despite of some disappointments that we had encountered about the ferry and our co-passengers, I think the Phi Phi group of islands deserves another chance of visit. 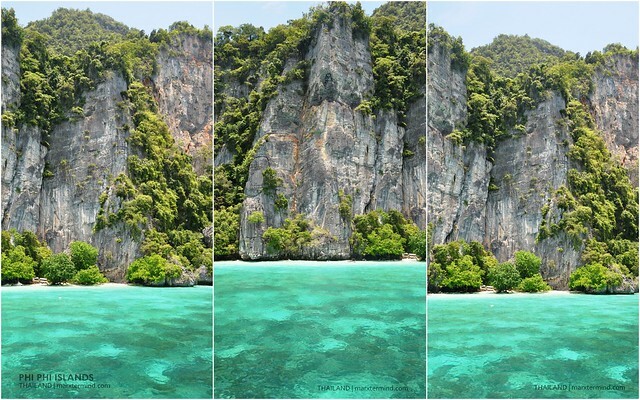 Hey, I’m still eager to get to Maya Bay and have a picture taken there. 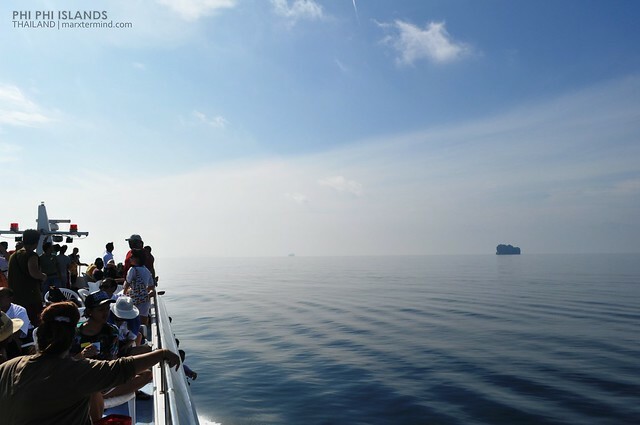 The cruise may not be a perfect way to tour the islands but it was a learning experience. Maybe at least a one night stay in the island would be a better way to enjoy and explore this mesmerizing beach I’ve first seen on screen. Hi marx…me and my friends were planning to visit Thailand perhaps on May. 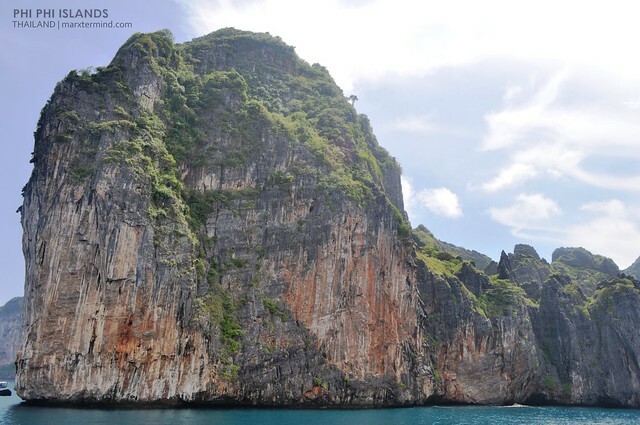 My question is, do you have any idea how much will be the room rate per day in Phi Phi? What are the other activities that you can do or sceneries you can see? 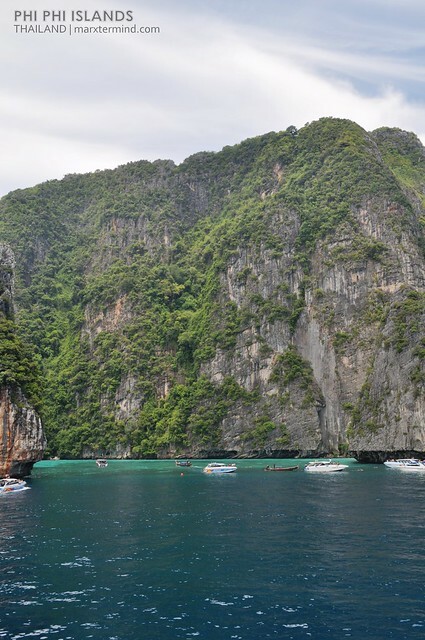 And, how much is the cost of renting a boat going to Maya beach?